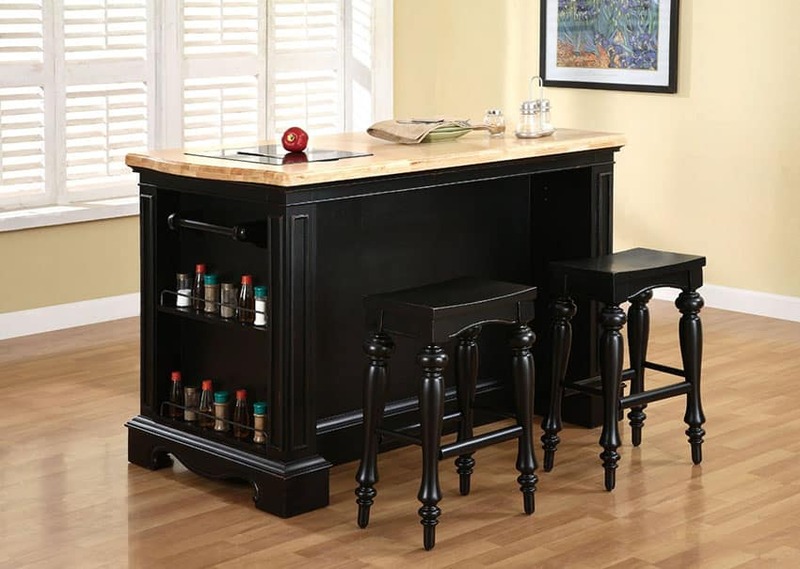 In this gallery we share a variety of portable kitchen islands with rolling and movable designs. A movable kitchen island is ideal for those who don’t want a costly remodel or have a small profile kitchen. Rolling kitchen islands can be ideal to give you extra food prep space as well as give your kitchen a little more design flair. The variety of portable kitchen islands means you can have fun and add your own personal style to your kitchen space. In the picture above, this movable kitchen island is quite small in size, with proportions and form reminiscent of console tables. 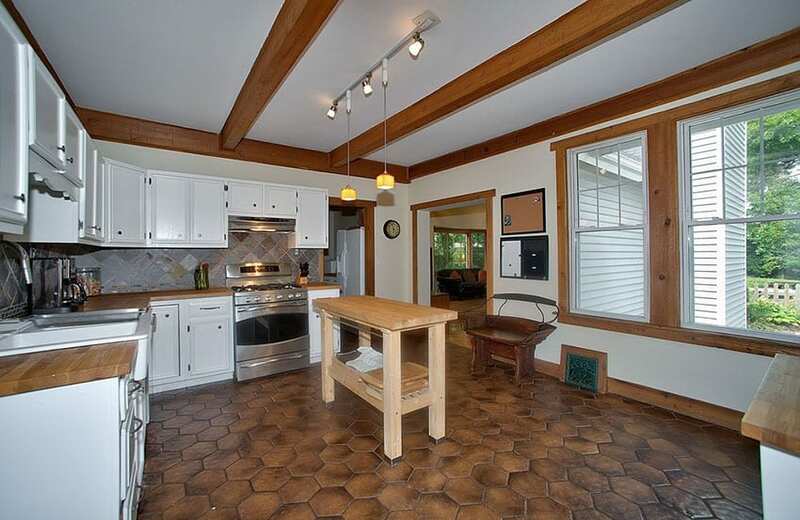 It has a solid oak wood base, matching the floors of the kitchen and has a thick slab of marble on top. The lower part of the base is open instead of having a fully-enclosed storage space, making it look lighter. 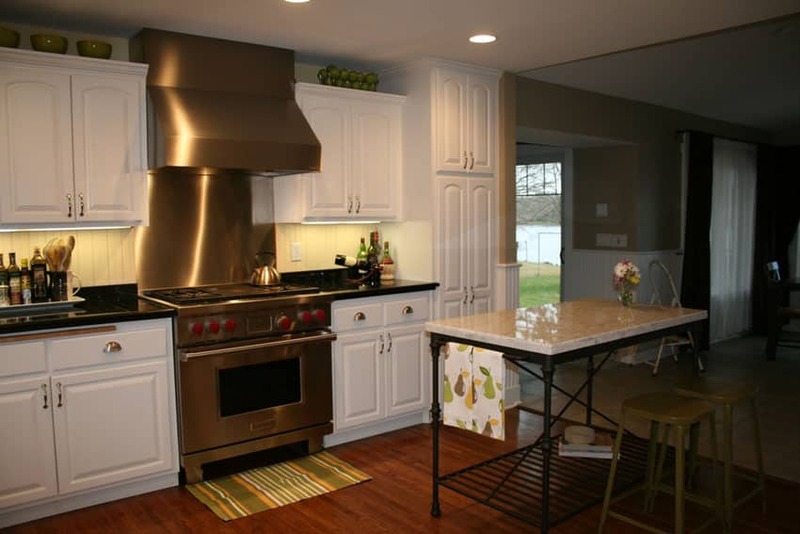 There are a variety of types of movable kitchen islands. From portable carts, or tables and islands with legs or wheels you can find a style to match your specific kitchen style. Whether you want a butcher block countertop surface for meal prep, stainless steel, granite or concrete surface you can find it in a portable island. 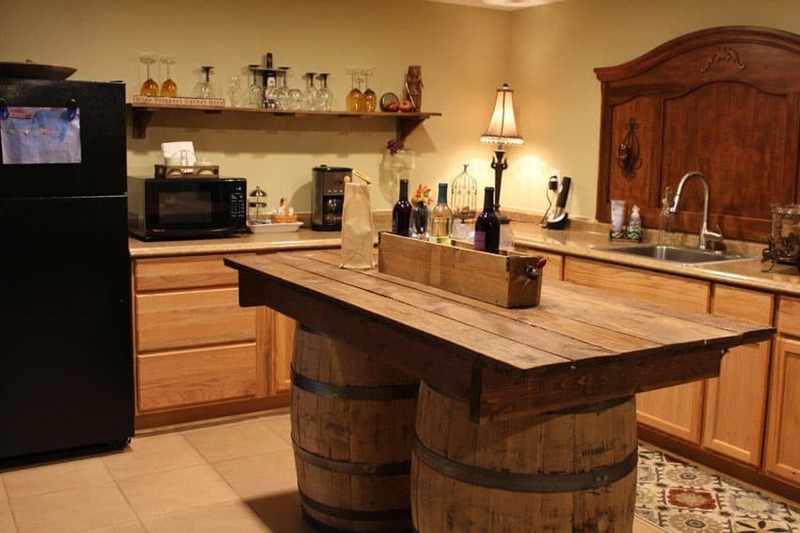 Click here to see more kitchen islands and carts. Matching the modern rustic style of the whole kitchen space, this mobile kitchen gives that authentic weathered look. Antiqued white painted legs with open shelf topped with a block of salvaged wood in its natural finish really gives that rustic appeal. 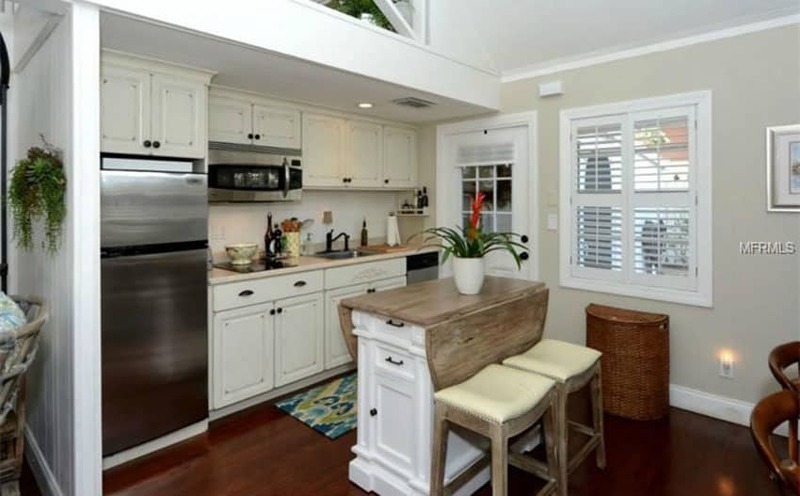 This small kitchen island perfectly complements the kitchen and completes the look. 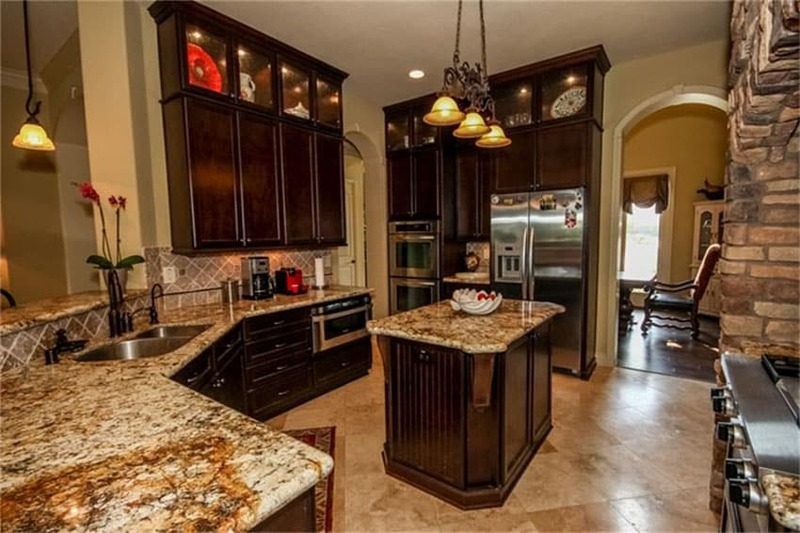 Surrounded by classic style kitchen cabinets. this movable kitchen island stands out with its natural weathered wood finish. Using large pieces of solid wood and a thick wooden slab for the top, it has a slid and heavy look, but has rustic look. It provides a nice break from the uniform finish/color of the walls and the kitchen, adding more personalty to the kitchen. The over-all interior of the spaces has that classic cabin-like feel, using natural finishes in their natural earthy tones. Similar to the wood finishes of the walls and ceiling of this space, the movable kitchen island uses solid oiled teak wood, keeping the natural beauty of its color. 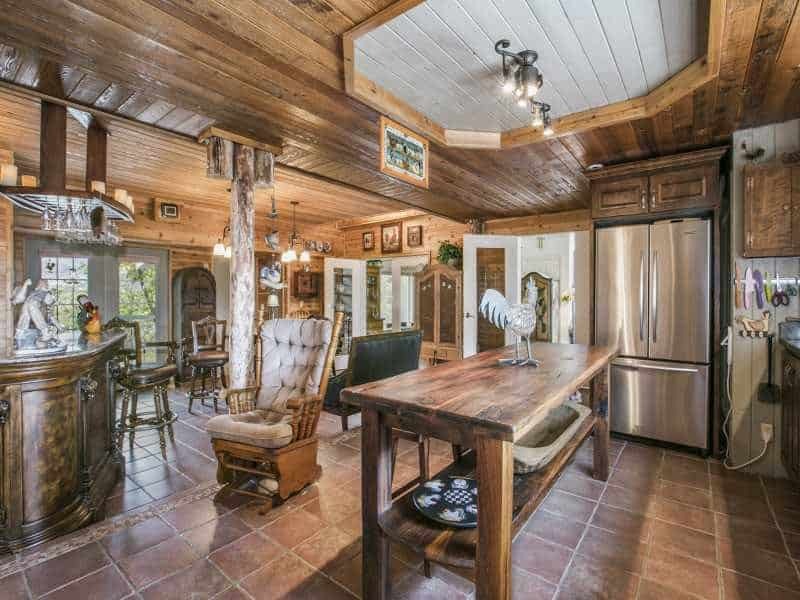 This island is made purely of wood and has a long rectangular shape with one open shelf below. 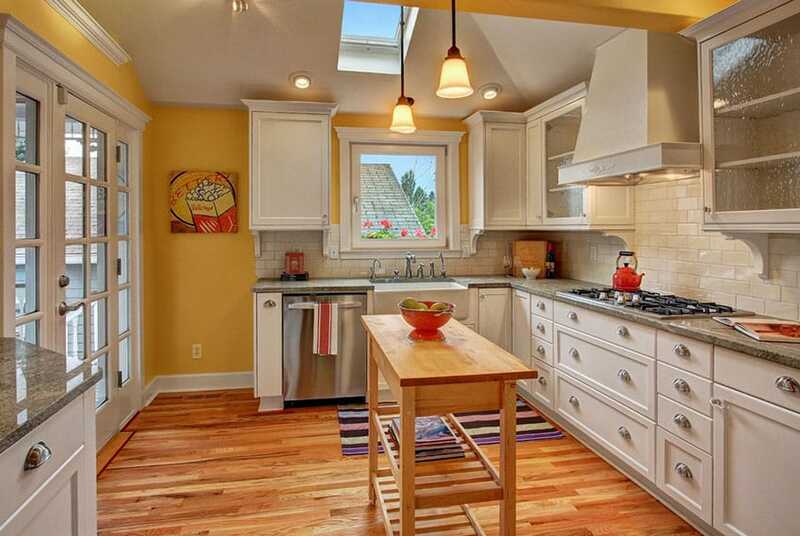 Yellow gold walls gives this transitional style kitchen a bright and cheerful vibe. To counter the bold color of the walls, the kitchen used white cabinets with gray counters and white backsplash tiles. For the kitchen island, instead of similarly styled fixed island, this kitchen uses a movable kitchen island in solid pine wood. The slim framing and construction of the narrow kitchen island gives it a light and modern look, while the open shelves underneath helps make the kitchen look open and bright. Rustic finishes and elements can be found throughout this kitchen, combined with other modern elements/finishes, creating a rustic kitchen which looks light instead of heavy. In the middle of the kitchen is a very unique movable kitchen island which is made of salvaged/re-purposed materials. The base of the island is made from two wooden wine liquor barrels, while its top is from an old dining table with its legs removed. The result is a very unique kitchen island, which can even become a conversation piece. Classic-inspired interiors calls for classic-inspired kitchens. This lovely kitchen uses neo-classic inspired motifs and applies it on the kitchen design. The kitchen cabinets are all in an of-white color, making it stand out against the dark walnut floors. The movable kitchen island at the center of the kitchen stands on carved legs and has a full cabinet base with dark walnut top, matching the wood tone of the flooring. Right above it is a stainless steel pendant lamp for accent. Matching the clean modern look of the kitchen space, this small movable kitchen island uses the same finishes as the main kitchen, but instead uses a solid teakwood for the counter top. 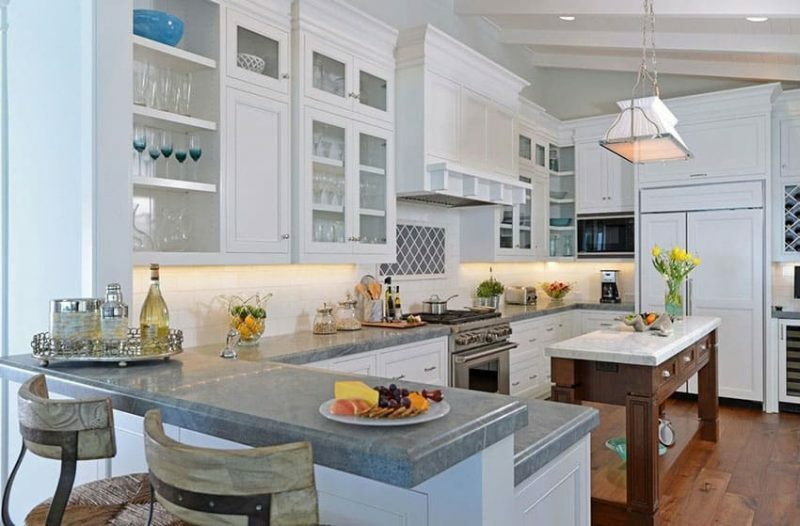 The base of the island has 2-layered open shelves with gray laminated shelves and also has space for bar stools on the other side. Hanging right above the small kitchen island is a metal pot rack, adding a retro touch to the kitchen. 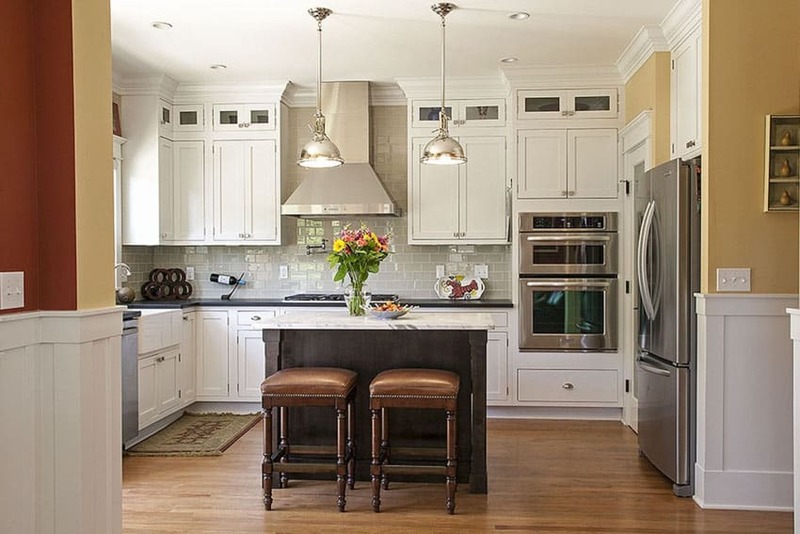 The whole kitchen has traditional look, taking inspiration from Corinthian motifs and finishes. The small rectangular kitchen island at the center also goes with the over-all look of the kitchen, using traditional style cabinet base, but with a raised/movable configuration. 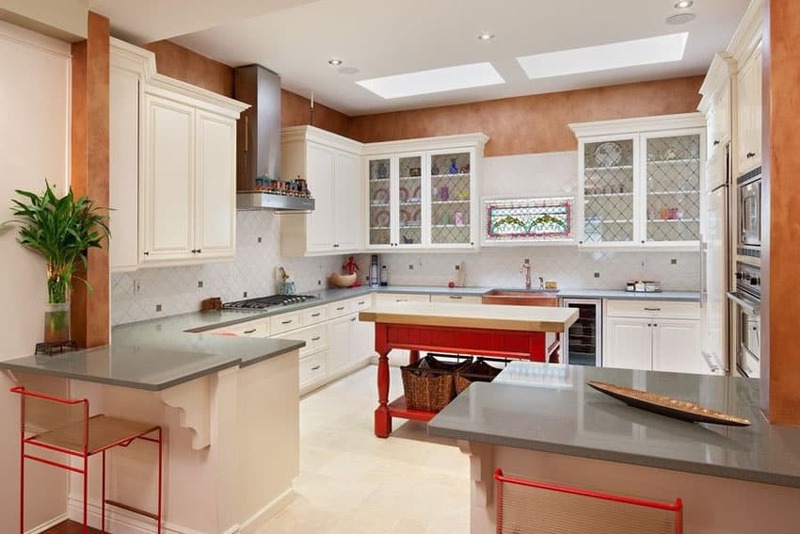 Unlike the main cabinets though, it uses dark Mahogany counter top instead of white granite, add a touch of contrast and setting it apart from the rest of the kitchen. A small kitchen space which uses traditional style kitchen cabinets on beige-painted walls. The main cabinets of the kitchen is white with black galaxy granite counters, while the movable kitchen island paints its base in black ad tops it with solid beech wood. The open space underneath the counter is used to stow the matching set of three black bar stools which has beechwood seats. 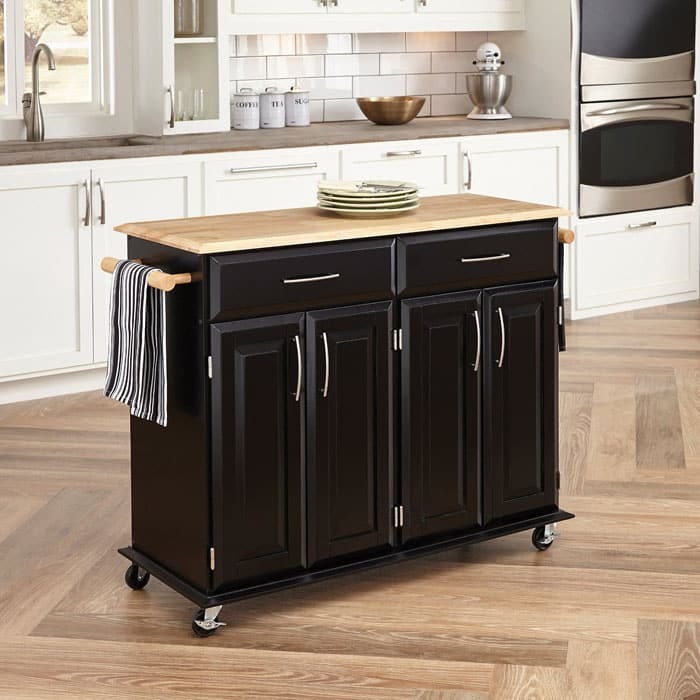 This small movable kitchen island is a perfect addition to traditional style kitchens, as it classic-inspired elements like moldings and detailed counter top nosing. 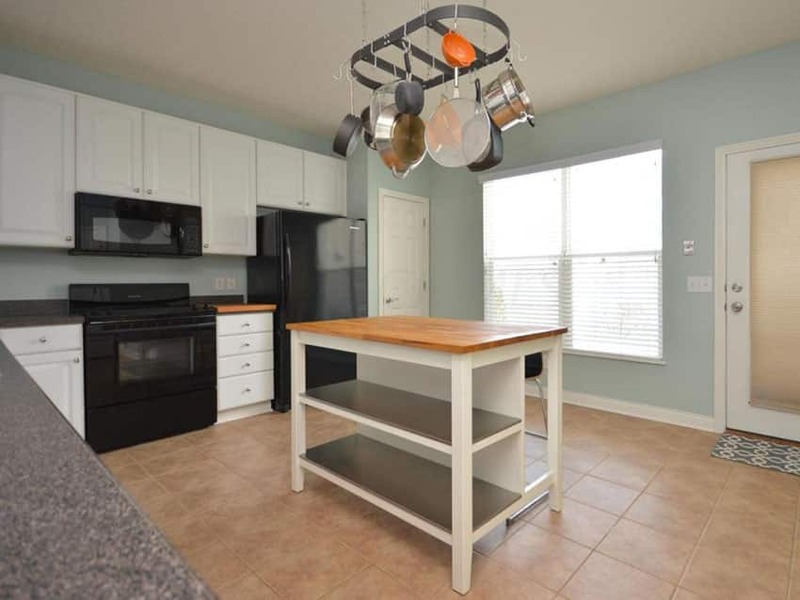 The kitchen island has a narrow shelf on its sides for condiments, and also has a matching pair of bar stools with turned legs, with the same black finish as the kitchen island. 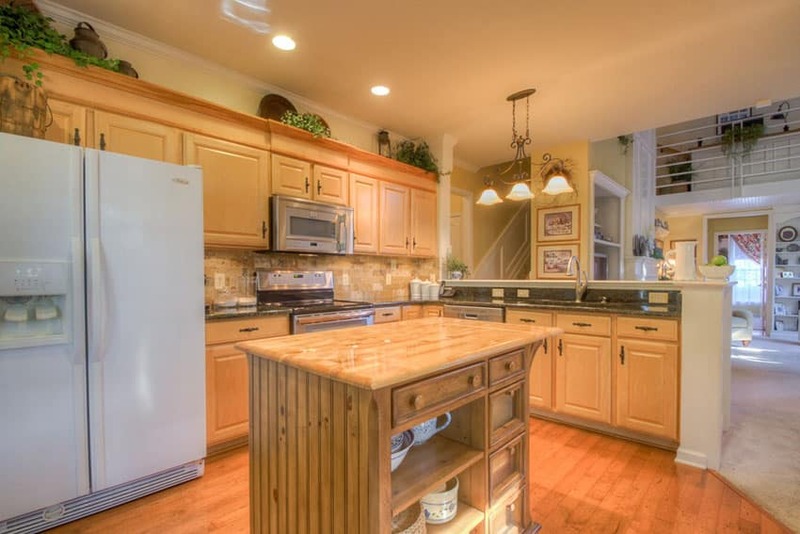 Maple laminated kitchen cabinets gives his kitchen that natural orange glow. 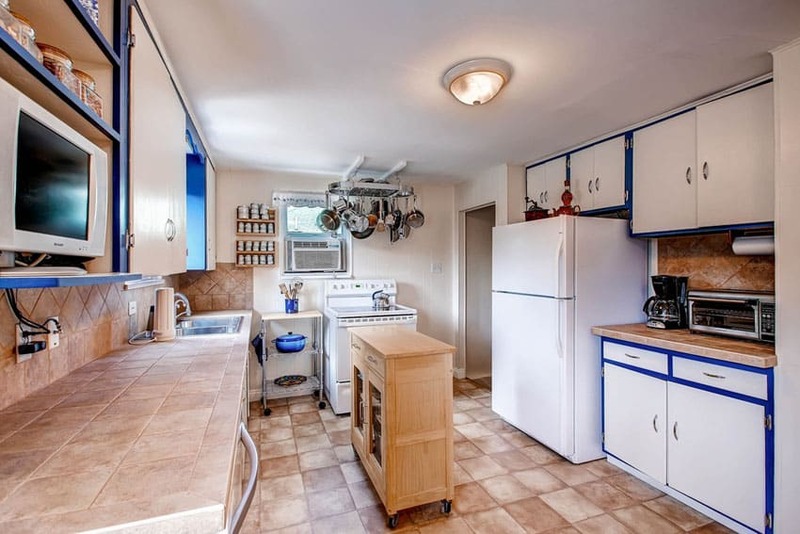 To add to the efficiency of the kitchen, a small movable kitchen was placed in the the middle. The kitchen island uses a more neutral oak finish to counter the orange and red of the kitchen cabinets and floors, while the light yellow granite counter somehow matches the color of the maple cabinets, matching this kitchen island with the rest of the kitchen despite using a different base finish. This movable kitchen island has a slim and modern profile, matching the clean lines of this modern kitchen. 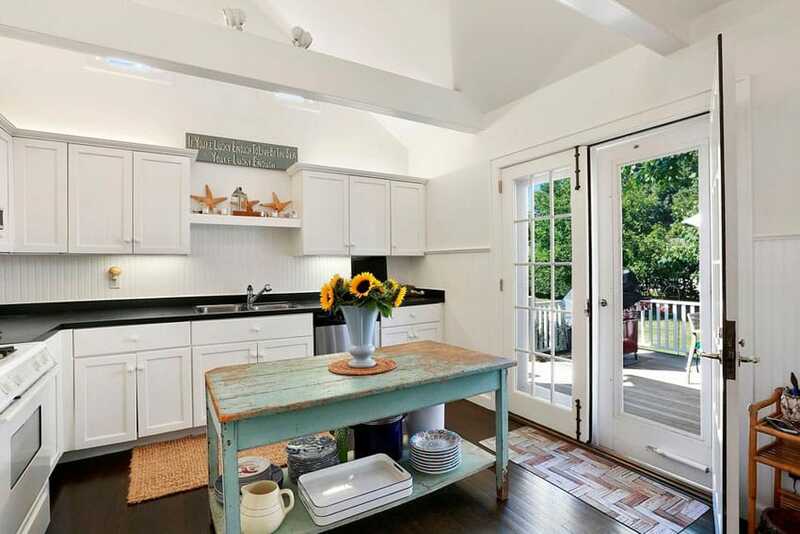 The wooden legs of the kitchen island is painted in white, with gray open shelves and a solid wood counter top. A wooden backing divides the open shelves from the other side of the kitchen island which can be used to stow bar stools. 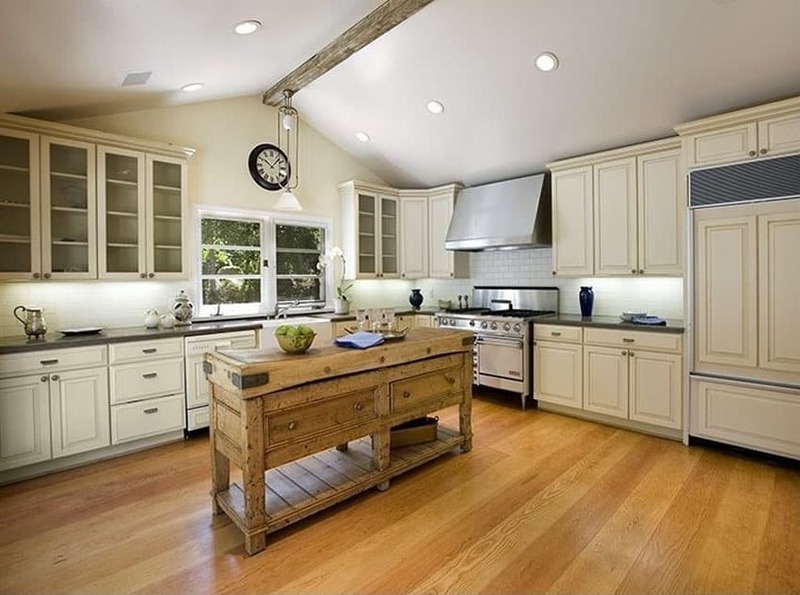 This traditional style kitchen uses a small, movable kitchen island in favor of the usual fixed kitchen islands. The rectangular island is in dark walnut finish, which makes it stand out in the kitchen, as the main cabinets are painted in white. It has an elegant marble top, and two leather-upholstered barstools, emphasizing its timeless, classic appeal. Limited calls for transformable, compact pieces, and this classic style kitchen is not an exception. The built-in cabinets have an off-white finish with light cream counter top, while the movable kitchen island is painted in white. The kitchen island is narrow, to to create a dual-purpose piece, its walnut top is actually a drop-leaf table, which opens to become an oblong shaped table for when you need additional dining space. Placed in a modern transitional kitchen space, this antique kitchen island adds a romantic/classic element into the space. The base of the kitchen island has carved legs with louvered cabinets and light maple wood counter top. Right above the island are two Edison bulbs hanging from a thick wire, giving it a retro vibe. White built-in cabinets, while walls and door frames, this kitchen definitely has that clean and crisp appeal of modern spaces. In an attempt to break the monotony and add a unique element into the kitchen, the kitchen island used is a vintage piece, with weather teal paint finish and n open shelf base. 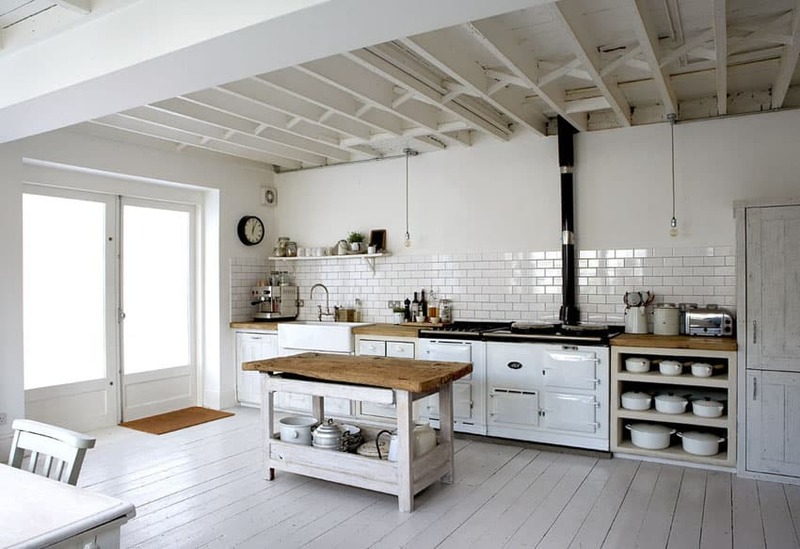 The kitchen island adds a shabby chic element into the clean an modern space, giving it a touch of vintage. A modern kitchen space with a spacious floor area and unique hexagonal floor tiles in a burnt brown color. The main kitchen cabinets are white with solid teak counter top. In the middle of the kitchen is a narrow movable kitchen island with proportions similar to console tables. It is of solid wood maple construction with an open base. This small kitchen makes use of a lightweight mobile kitchen island with beige granite top and black metal legs. The details of the metal legs still matches the classic look of the kitchen, and as the wrought iron framing and legs of the island are thinner than wood-framed islands, it looks lighter and doesn’t obstruct the view from anything. It also has 2 metal bar stools placed beside it which also makes use of thin metal framing. 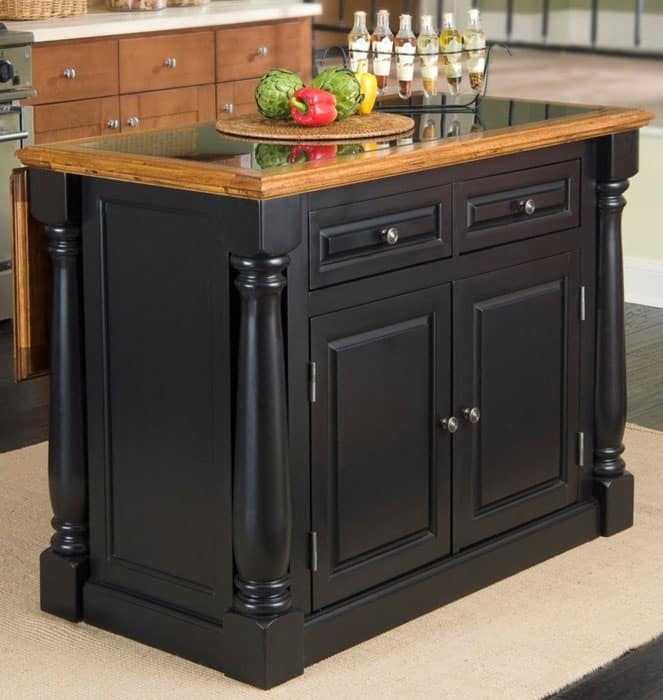 A rolling kitchen island in black with paneled cabinet design and solid maple counter top. It has handles on both sides, enabling you to pull it/move it around on either end. The design is a classic, allowing you to place it on any traditional style kitchen, or even modern kitchens. Read more about the Home Styles Dolly Madison Kitchen Cart here. This mobile kitchen island is a great addition to small kitchens. It’s wheeled base makes it easy to move, allowing you place it where needed, and even use it as a serving cart. The design of this kitchen island matches the style of the main kitchen cabinets in white, but tops it with black granite instead of white solid surface for added contrast. 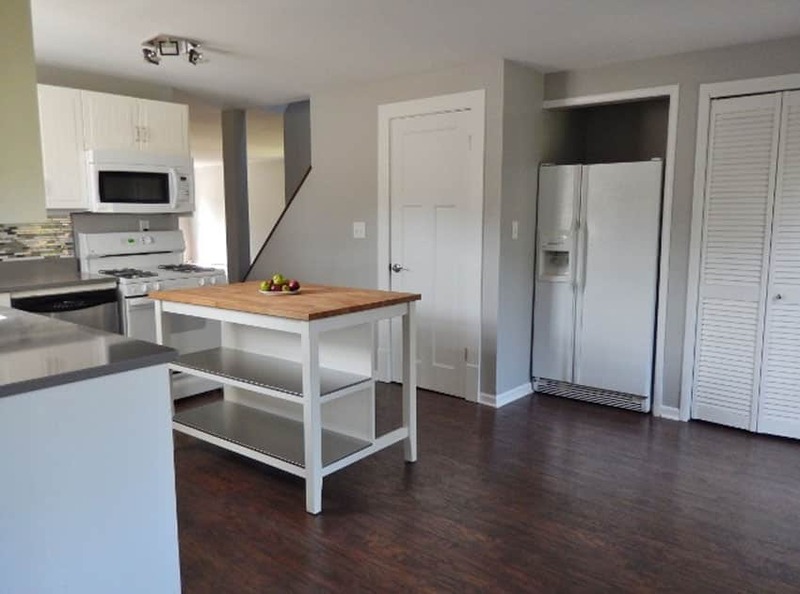 This modern kitchen has quite a limited space, so instead of using a fixed kitchen island, it opted for a rolling kitchen island as it allows you to move it around according to how you want to use it or set it aside if you need more floor space. It can also function as a trolley, allowing you to transport items or food to other areas of the house. This design is of solid maple wood construction, giving it a light and natural look. 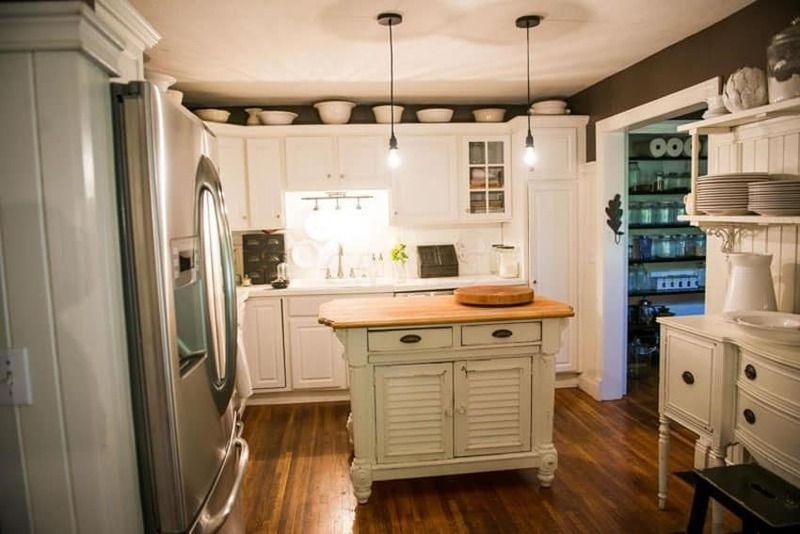 This kitchen has a very unique choice for its portable kitchen island. It uses a wood-framed movable kitchen island with solid stone top; what makes this unique, however, is that its base legs, sash and shelves wee all painted in red, making it standout from the dominantly-white kitchen. 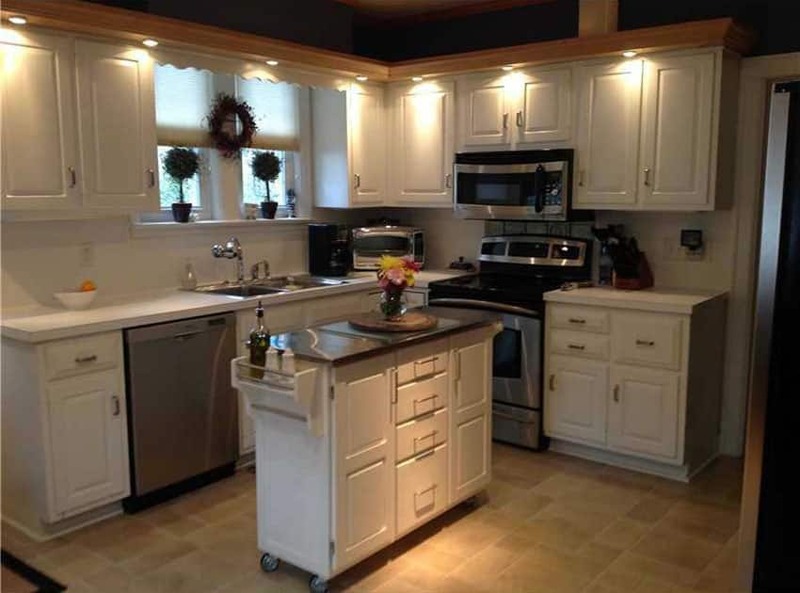 This is a simple traditional style movable kitchen island. It is quite small in size, and unlike most movable kitchen islands, it has a solid base and does not stand on legs, making it appear like its a fixed kitchen island. The base is painted in black, while its top is a combination of solid teak wood and black glass. Portable kitchen islands like this are versatile and great for positioning it where you need it for food preparation and to get the right work triangle for the task at hand. Read more about the Home Styles Monarch Granite Countertop Kitchen Island (Oak or Black Finish) here. 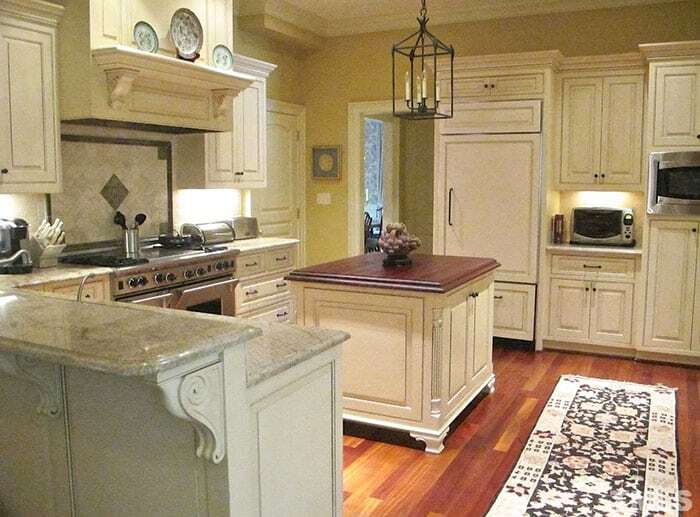 This traditional kitchen tends to be very overwhelming as it uses dark wood finishes and full height cabinets. 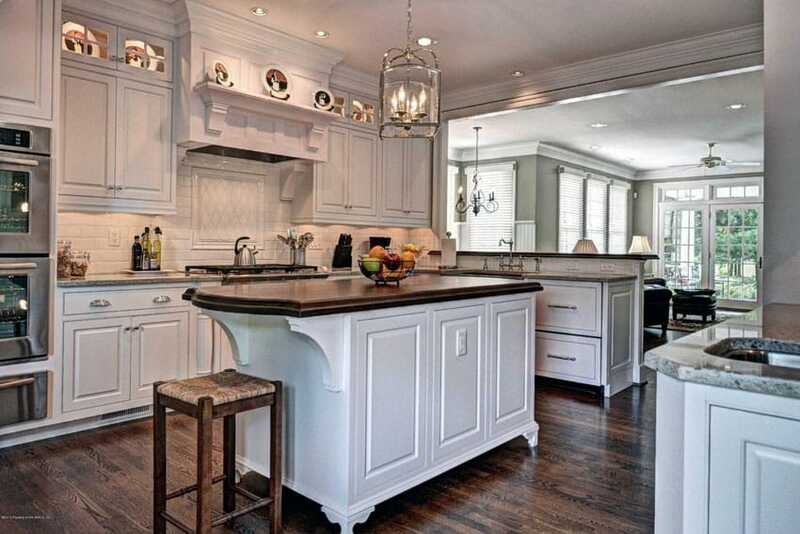 To balance it out, it uses a smaller kitchen island, but using the same style and finish as the built-in cabinets. 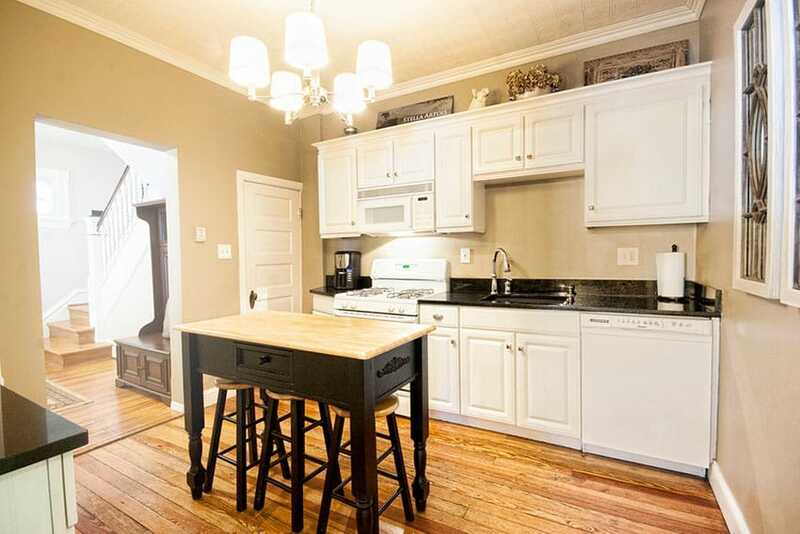 This kitchen island is small and movable, but has a lot of cabinet storage space.